We just received our latest set of Spitfire suspension bushings. If you're new to this build, we'd earlier lamented that our first two shipments of said bushings were disappointing because the center tubes had a 10 mm I.D. instead of the prescribed 3/8". We'd anticipated using high-strength AN hardware in all of our suspension fittings, and all bracket holes were carefully drilled to 3/8". So 10 mm just wouldn't do. This latest attempt to purchase actual Spitfire parts was based on an ad for a Suspension Rebuild Kit that even included the bolts. They wouldn't sell you 3/8" bolts for a 10 mm tube, would they? Actually they might, but in this case, amazingly, they didn't. 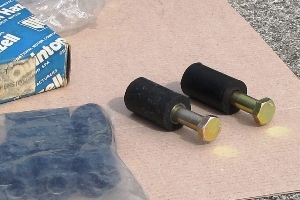 These bushings were genuine BMC replacement parts, not cheap foreign knock-offs. They were emblazoned with the "Metalastik" logo, and were a perfect fit on a 3/8" bolt, which re-instilled our faith in the British automotive market to remain firmly entrenched years behind the rest of the automotive world. There's a whole lot more rubber on these bushings, and it's way better quality. Less foamy. The tubes are thinner for the slimmer 3/8" bolt, and the overall diameter is bigger, so the rubber sleeve is thicker. We were a little concerned when the old off-brand bushings slipped into the steel bush tubes too easily. These new bushings will be a hard press fit, and will no doubt last for thousands of miles on the Locost. Or more. We're stoked, or as the British would say, or at least some of them, we're "chuffed". Fresh off this motivational success, we're going to start dismantling the donor in earnest now, which means we'll be racking up build hours again. Finally. It won't be easy to deactivate the M.G. after all that effort and success in getting it running. The first start. The first drive. Such memories. 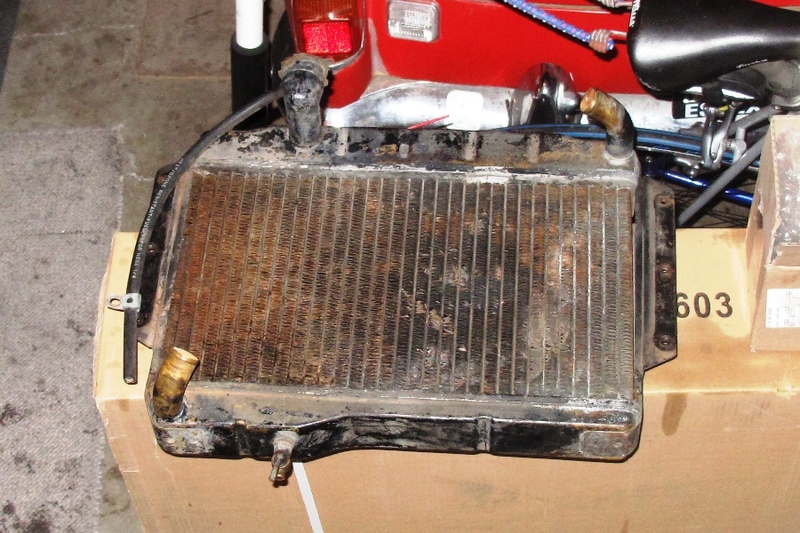 We wanted to take the car for one more spin before its ignominious disassembly, but I was uncomfortable with it constantly overheating, so I thought we'd try installing the other radiator, the one we acquired last year from eBay. An early test confirmed the radiator held water, at least when cold, but a closer inspection revealed a distressing number of bent and closed-up cores. The Locost book tells you to clean the radiator with a good soak in a bath of engine degreaser. Clearly this would be of no help to this radiator. None of the core tubes were split, but half the cooling fins were bent askew, preventing most of the oncoming air mass from passing through. So we got out a few small flat-blade screwdrivers and proceeded to bend them back in place, one fin at a time, and in case you were wondering, or even if you weren't, that's just over 4000 fins. And they have to be straightened on both sides. Once the job is done we'll plug the radiator into the M.G. and see how it does on the road. If it works, it'll get a thorough cleaning inside and out and a fresh coat of black paint. If it doesn't, we'll be 0-for-2 on the used radiator market, and unlikely to push our luck any further in that direction. In which case we'll be forced to requisition another $250 from the Locost budget for a new one. Actually picture is the display of some one feelings; it offers the lesson to the users. Hi mates, nice article and fastidious urging commented at this place, I am truly enjoying by these. Its absolutely brilliant YouTube video in terms of features, actually fastidious, its quality is actually appreciable.